Meet Jenn, Our Nov. Mommy of the Month! This month's M.O.M winner is Jenn N. from The New Deal Daily! Here is her exclusive interview post with me. Tiffany: How long have you been blogging? 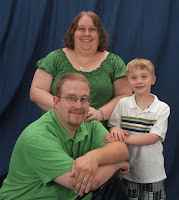 Jenn: I have been blogging on our personal adoption blog for about a year. I just started doing deal/review blogging about 3 months ago and I love it so far! Tiffany: What started you blogging? Jenn: I have a few friends that blog and I loved reading them. I thought it was something I could do myself, so I did some research and then just jumped right in! Tiffany: What is your blog about? Jenn: My blog is about finding the best deals for Moms and Kids on the products you need. I also love to do product review and giveaways. You'll also see bits and pieces of my family there too! Tiffany: What is the best deal you have ever gotten? Jenn: Well I got 5 pairs of flip flops today at Old Navy for .23 each, that's pretty good! I'd probably say my best deal was last Christmas when I got my son a Leapfrog Tag Reader for $4.99 - normal price was $40.00. It was a combo of sales, store coupons, and manufacturers coupons. He still loves it! Tiffany: What is a typical day for you? In the afternoons, I usually work at my second job which is as a mentor for children and teens in the foster care system. Once I'm done there I pick up my son from school, head home and start dinner. While I cook, I'm helping him with his homework or listening to him read to me. After dinner I try to spend some quality time with my son before he goes to bed. After he's in bed, I watch TV or a movie with my husband, play around on the computer or maybe read, pack lunches and my son's backpack for the next day. Then it's time for bed before I get up and do it all again! Tiffany: What do you like to do for your "Me time"? Jenn: You will usually find me on the computer either blogging, on facebook, or my favorite Mommy website - www.mamasphere.com I also love to read! Tiffany: Do you have regular "Me Time" or do you have to snag it whenever you get a chance? Jenn: I try to carve some time out for myself every day, even if it's just 20 or 30 minutes. It doesn't always happen, but when it does I am a much happier Mommy! Tiffany: What has been the toughest parenting issue you've faced? Jenn: Dealing with my son's allergies and asthma. He is severly allergic to peanuts and also a few other foods plus TONS of environmental allergies. On top of that he has severe asthma. It's practically a full-time job keeping him healthy. Since this all started when he was 16 months old I have learned so much. I am his #1 advocate and I work hard to stay on top of his medication, doctor's appointments, and diets. It's definitely a challenge, but so worth it! Tiffany: What is your best advice to new moms? Jenn: Don't be afraid to ask for help if you need it! Whether it is something as simple as holding the baby while you nap, or as serious as Post Partum Depression, we all need help! There is no shame in asking your family and friends. You'll probably find that most people will be thrilled that you asked! Motherhood is hard work and we are all in this together. Tiffany: Just for fun - What celebrity do you have a crush on? Jenn: Patrick Dempsey - McDreamy? Yes, please! Thanks for the interview Jenn! I hope everyone will get the the chance to stop by her blog and say "hi!" Her blog button is featured on the sidebar the rest of November. As the winner of our contest, she has also earned a permanent feature on our M.O.M (Mommy of the Month) Wall of Fame here! Want to be a featured M.O.M? I will be accepting applications until November 6th!! Enter for December's featured Mommy today. Get all of the details here. November's M.O.M. poll will be posted on the sidebar on Nov. 7th. Remember to vote!